Embrace the culture, relaxed vibe and outstanding natural beauty on the island of Mauritius with a stay at one of these fantastic 3-star hotels. 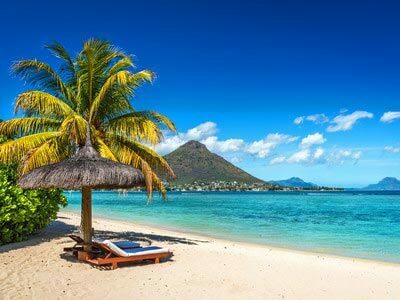 Take a look through some of our favourites and find the cheapest deals on Mauritius holidays. 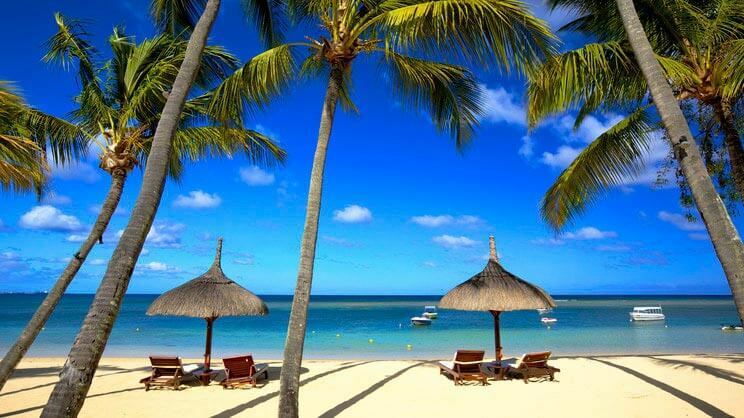 Experience the enchanting delights of Mauritius with our impressive range of 4-star holidays. Escape to the idyllic sanctuary of one of the many magnificent resorts hidden away in this exquisite tropical paradise. 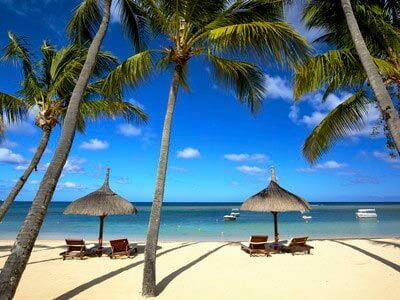 Sapphire seas, crystal-clear lagoons and long stretches of pearly white sand make Mauritius a jewel of the Indian Ocean. We've put together our top picks for 5-star holidays with a level of luxury beyond your wildest dreams. Known by global holidaymakers as a tropical paradise set in the turquoise waters of the Indian Ocean; Mauritius offers white sandy beaches, lush green forests and a peaceful, friendly atmosphere - making it the perfect luxury escape for families, couples and friends. From cultural experiences to complete relaxation on a white sand beach, holidays to Mauritius radiate charm, offer breathtaking views and some of the most picturesque beaches in the world. All year round, families can enjoy outdoor adventure, fun and frolics, as well as plenty of fresh local cuisine. It’s also a favoured location for honeymoons and even dream weddings. Whether you want to enjoy lazy nights under stunning sunsets or discover refreshing lagoons and waterfalls - Mauritius offers a wealth of variety for guests of any age, so make it the destination for your 2019 or 2020 holidays. Officially known as the ‘Republic of Mauritius’, the country is comprised of the islands of Mauritius and Rodrigues, the latter of which is located 350 miles east. The capital Port Louis is located to the north west on the island of Mauritius. Flights: Many airports have flights to Mauritius including Birmingham, Edinburgh, London, Manchester and Newcastle. Passport/visa requirements: Your passport must be valid for the entire duration of your stay in Mauritius. Packing essentials: Mauritius is known for beautiful beaches and turquoise waters - try and pack thin, light beachwear and plenty of swimwear options. The most populated area of the island is Port Louis, which provides some of the best shopping, dining and nightlife for locals and holidaymakers to enjoy. Overlooking the city is Fort Adelaide, another must-see area for those seeking out the more vibrant parts of Mauritius. Built by the British between 1834 and 1840, it now hosts shows and concerts, alongside offering one of the best vantage points for photos looking out over the capital. To the north you will find Grand Baie (or Grand Bay), a tourist hotspot that includes two stunning beaches and the beautiful village of Cap Malheureux with its famous red-roofed church. Surround yourself with exotic and indigenous plant life with a stroll around Sir Seewoosagur Ramgoolam Botanical Garden, or discover the biggest Hindu temple in the region at the Maheswarnath Mandir of Triolet. To the west and south-west you are likely to find an abundance of nature parks and unspoilt scenery. The Black River Gorges National Park covers over 16,000 acres and has 311 species of native flowering plants. It is also home to Piton de la Petite Riviere Noire, which is the highest peak on the island. Le Morne Brabant is another fantastic area to find hotels, golf courses and to try kitesurfing, windsurfing or surfing to the south. To the south and south-east there are many more nature reserves and areas of cultural significance. They include Cavendish Bridge, Pointe Canon, a small fishing village called Mahebourg and the Battery of Devil’s point. To the east, tourists will be able explore countless stunning beaches including Roches Noires, Poste Lafayette and Belle Mare, and enjoy swimming, snorkelling and scuba diving. For curious holidaymakers there are also caves in the area at Roches Noires and Pont Bon Dieu that are around 15 metres high and 20 metres wide! The inland and central regions of Mauritius are much cooler. Offering lush forests, stunning lakes and vast plantations to explore. Highlights include hiking the Moka Mountain Range, tracing the “Tea Route” from Domaine des Aubineaux to Domaine Saint Aubin, visiting the Rum Factory at La Rhumerie de Chamarel and hiking the renowned Seven Waterfalls. Port Louis, the capital of Mauritius is the central business hub of the island but is also home to the stylish Waterfront where some of the best shopping, dining, and nightlife can be enjoyed. Coupled with Fort Adelaide built by the British in 1835, which now hosts shows, concerts and artists, it’s definitely a place to experience. Awash with Caribbean flare, the North Coast and primarily Grand Baie is also home to restaurants, discos and social nightlife as well as a few charming sights such as Botanical Gardens, the Red Roof Chapel at Cape Malheureux and of course the stunning beaches. Discover emerald lagoons, village life along the coast, and traditional village shopping, including some fantastic wind sports on the Belle Mare Plage Beach. The naval museum in Mahébourg and Vieux Grand Port hold a lot of the history and heritage and there are the protected coral reefs for avid water enthusiasts. From the rum distillery, saltpans and cultural landscapes that have made the UNESCO World Heritage grade, Mauritius holiday makers will be in their element. 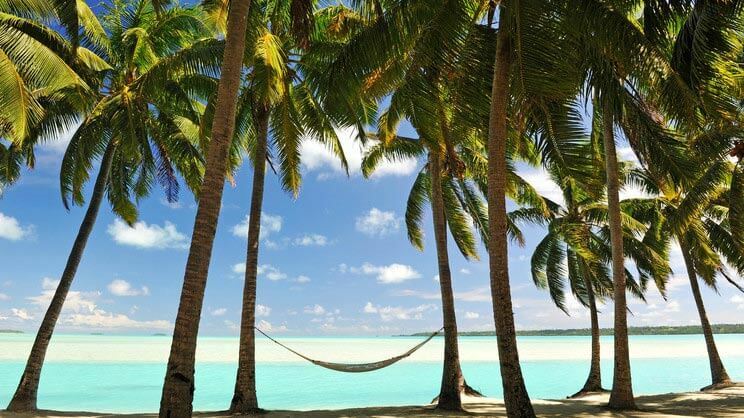 You enjoy lounging on white sandy beaches, exploring lush tropical forests or swimming in turquoise waters - this island has something for everyone. With a fairly mild climate throughout the year, Mauritius is perfect for families seeking blissful summers on stunning tropical beaches. The most favourable times to visit are considered to be September to December and April to June. Temperatures are in the 20s - making it the ideal time for diving and surfing. The peak summer season is between the months of November and April, when it is relatively hot and humid, with average temperatures in February of 26°C and 29°C on the coast. There are plenty of stunning beaches to discover when visiting Mauritius, with over 160km of white sand in total, giving tourists plenty of options when on holiday. 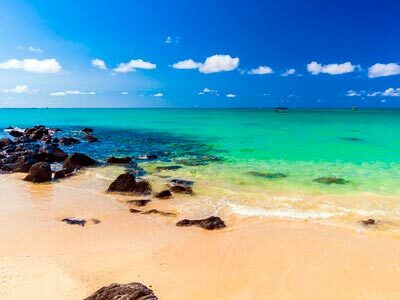 Depending on where you end up staying in Mauritius, you will have options of which beach will be most suitable for you and how you would like to fill your time during your holiday. Grand Baie is one of the most popular beaches on the island for watersports, with plenty of boats taking sightseers on excursions to the northern islands. Try your hand at parasailing, windsurfing, water skiing, deep sea fishing, yachting or catamaran cruises. Île aux Cerfs also offers a wide range of water sports and is a private island situated on the east coast of Mauritius. Why not try out banana boat rides or even hire a speed boat to explore the area from the water? Blue Bay is well known for snorkelling, scuba diving and glass-bottomed boat tours given it is a protected marine park in the south-east. Tamarin Bay on the other hand is known for being the only surf beach open from July to September and has a surf school for those wanting to learn. Located on the west coast of the island, tourists can also swim with dolphins! Belle Mare Plage is made up of 10km of beautiful white sandy beaches, and is known for its collection of upmarket restaurants close by, including Laguna Bar at Constance Le Prince Maurice, Poste de Flacq and Barachois, which is a floating bar and restaurant. Located on the east side of the island, Belle Mare Plage benefits from south-easterly trade winds that will keep you cool on a hot summer day. Over on the west coast, Flic-en-Flac is a seaside town with a fantastic white sandy beach that stretches for 8km. While the most luxurious portion of the beach is found at Wolmar where all the upmarket hotels are situated, the rest is open to families and locals who are welcome to enjoy the reef and calm waters, or simply lie back on the inviting warm white sand. From kicking back on one of a number of beautiful white sandy beaches, to hiking through lush forests to discover the Chamarel Waterfall or Tamarind Falls. Mauritius has a great deal to offer tourists visiting the island. Whether you want a relaxing escape or an active adventure, this tropical paradise can offer both in abundance. Hiking is a common pastime for both locals and tourists looking to explore the island of Mauritius. You can enjoy the lush forests of the Black River Gorges National Park or discover the Trou aux Cerfs: a 300 metre crater of a dormant volcano that now includes a lake at its centre. There is a huge amount to explore inland on the island, including waterfalls such as Rochester, Chamarel and Tamarind, lagoons, plantations and plateaus. Also, the Seven Coloured Earths geological formation is a very picturesque and popular site for tourists. The unique landscape was formed by volcanic activity, which makes for a hiker’s dream when looking to explore. Just make sure you pack plenty of water to stay hydrated, and your swimsuit so you can take a dip in one of the many lagoons! Alongside inland lagoons, lakes and waterfalls, there is the most beautiful coastline to enjoy where tourists can swim in warm turquoise waters and lie back on serene white beaches. While this might seem like a relaxing haven, there are still plenty of thrilling activities to enjoy during your stay. Visit Grand Baie in the north for a huge range of watersports including parasailing, windsurfing, water skiing, yachting, catamaran cruises and deep sea fishing. In addition, there is a Solar Undersea Walk, where you wear a helmet and walk along the sea bed, as well as tandem skydiving available close by. At Trou aux Biches there is a diving centre for those wanting to snorkel or scuba dive, the dive even includes a visit to a sunken wreck at Water Lily. The private island of Île aux Cerfs offers a huge range of watersports including banana boating, speed boat rides and parasailing. The most famous dive site in the east of the island is located at Belle Mare Plage and is called The Pass. For those wanting a more steady pace during the warm days, how about visiting one of the many botanical gardens on the island to discover an array of native and endemic plant species. The Sir Seewoosagur Ramgoolam Botanical Gardens is also known by the name Pamplemousses and is located near Port Louis, with over 500 plant species for you to discover. Alongside the aforementioned Black River Gorges National Park, there is also the Bras d’Eau National Park which is home to protected species of birds, exotic trees and a lake. The Casela World of Adventures includes safari tours, while the La Vanille Nature Park has crocodile feeding shows and giant tortoises. There are countless areas of cultural significance along with many museums on the island to understand the history of Mauritius in a lot more detail. They include the Jummah Mosque, Aapravasi Ghat World Heritage Site, the Blue Penny Museum, Chateau de Labourdonnais (a restored Victorian mansion on a sugar cane plantation), L’Aventure du Sucre (a former sugar factory) and Maheswarnath Mandir (a 19th century Hindu temple).